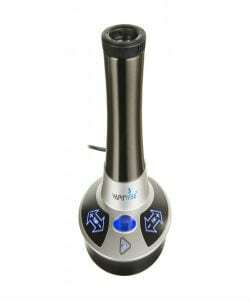 Home → Vaporizers → Desktop Vaporizers → Best Desktop Vaporizer: For When You Are Relaxing at Home! While portable vaporizers are some of the best currently on the market, there’s still something to be said about a really well-constructed desktop vape. You can certainly choose to use a portable vape as your go-to device whether you're on the go or at your home, but having a complete desktop vaporizer that you can use while relaxing at home is really fantastic. There are tons of different desktop devices to choose from, but what if you’re wondering what the best of them is? 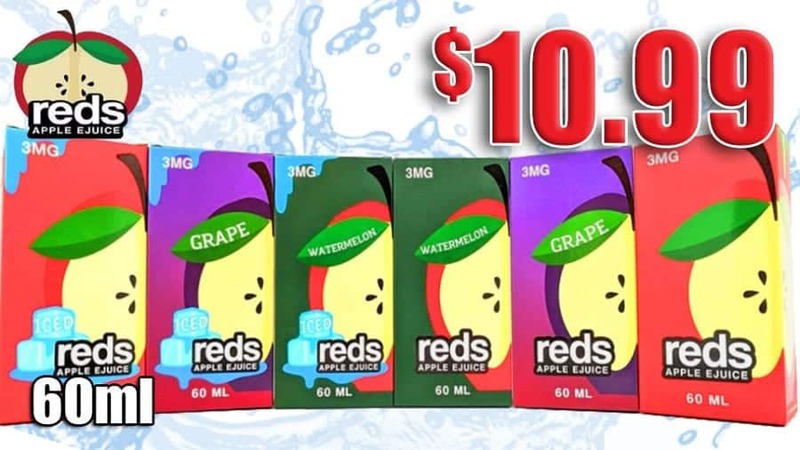 I’ve spent a good deal of time scouring the desktop vaping world to see what the options are that are currently on sale, and I’ve found 5 awesome choices that should be the perfect addition to your vaping collection. Whether you’re looking for something that’s ultra-powerful, easy on the wallet, or extremely stylish, there’s a desktop device here that’s perfect for you. Sleek and stylish design, somewhat average temperature control. Modern design with an attractive interface, really solid temperature control. Minimalistic design, occasionally inaccurate temperature control. Extremely futuristic design, excellent temperature control. Functional yet boring design, respectable temperature control. The Arizer Extreme Q is easily a solid choice if you’re looking for the best desktop dry herb vaporizer. This is a vape that’s created for quite a lot of buzz and attention in the vaping community as of late, and that comes with very, very good reason. For starters, the Extreme Q’d design strikes a great balance between being both minimalistic and stylish. The design here is very futuristic and clean, and it’s easily one of my favorite designs for a vape on this list. 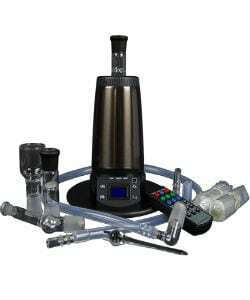 However, good looks are just part of what you get with Arizer’s option here. To go along with the Extreme Q’s extremely good looks, it features a big, bright display that makes it very easy to see all of your settings and adjustments, a nearly perfect balloon delivery system, and numerous vaping modes with a very strong performance all come together to make the Extreme Q a fantastic choice. The only real downside with the Extreme Q has to do with its temperature control. It isn’t necessarily bad, but it’s simply average and doesn’t do anything to take that extra step. However, all of the previously mentioned features and incredibly great ease of use evens this out quite a bit. Combine all of this with the fact that the Extreme Q costs just $199 at retail pricing, and you’re looking at an absolute steal. To keep going with my reviews, the next option goes by the name of the Vapir Rise 2.0. The Rise 2.0 shares a lot of similar features the the Extreme Q does, and if you’re willing to spend a few extra dollars for Vapir’s product, you’re getting a slightly better all-around product. Just like the Arizer Extreme Q before it, the Vapir Rise 2.0 boasts a design that strikes a fantastic balance between being both clean and eye-catching. The interface that’s used for controlling the temperature and fan settings is one of the best I’ve ever used, and the included accessories that you get out of the box make the vaping experience with the Rise 2.0 extremely enjoyable. Perhaps the most standoffish feature of the Rise 2.0 is its ability to connect up to 4 whips at a single time. This is something that you really don’t see with many other devices out there, and this makes it an absolutely awesome choice if you’re looking to vape with friends at the same time. The biggest downside for the Vapir Rise 2.0 has to do with the bags that are a bit complicated to fill, but this is a very minor complaint. 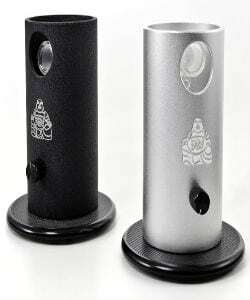 Da Buddha Vaporizer has perhaps the best name of any vape on this list, and it makes it clear right off the bat that it isn’t messing around with its 3-foot long tube whip and glass mouthpiece. The length of the whip that’s used here seems to be a bit longer that what you get with most other desktop devices, and this is something that I actually found myself to be liking quite a bit more than I would have thought. The temperature control that the Da Buddha Vaporizer offers isn’t the best that you can find, and is perhaps the weakest aspect for this product. However, when you consider the competitive price tag and included 3-year warranty that the Da Buddha come with, it becomes a very compelling buy. If you’re looking for the king of all desktop vapes, then you’ll absolutely want to look into the Herbalizer. This is easily the most expensive choice on this list, but if you have the cash to pay for it, it’s an absolutely wonderful buy. 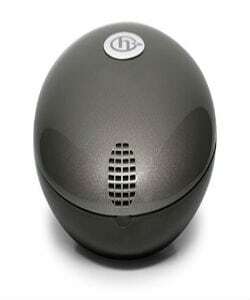 The egg-shaped design is unique, odd, and oh so futuristic. It has support for both bags and whips in addition to wax and oil concentrates, making it one of the most versatile desktop options that you can currently find. 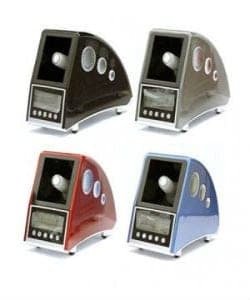 The Herbalizer can double as an aromatherapy machine as well, and its ability to remember the last temperature you were vaping at makes using it an absolute joy. Rounding out this list is the Easy Vape 5, and it’s about as far as you could get from the Herbalizer. The Easy Vape 5 is first and foremost a budget option if you’re searching for a solid vape that won’t break the bank, and although it may not be the flashiest machine in town, it offers a whole lot of power for under $100. The LED display that’s present on the Easy Vape 5 is big and easy to read, the controls are incredibly easy to use, and the included 5-year warranty adds for excellent piece of mind. The fragile parts present throughout the entire thing is a downside, but it’s a very small price to pay for such an affordable vape. Because of that, this is easily one of the best desktop options out there right now. If you were asking the question of, “What is the best desktop vaporizer?” going into this article, hopefully I was able to successfully answer that for you. There are tons of choices out there, and whether you’re looking to spend a lot of money or as little as possible, all of the options on this list are some of the best you can currently find. Good luck and for more info, check out our Vape 101 article, and for other types of vapes, check out our Best Vaporizer Review page.